Come 2013, these 720 Rapids will be galloping along in their own lanes during rush hour. The past year has seen many diverse transportation issues grab headlines in Southern California and across the country. A good way to appreciate how much has changed, or hasn’t, is to think back to what the world of transportation looked like on Jan. 1, 2010. In the dawn of this year, “30/10” was still a fledgling idea and BP’s Tony Hayward could still go yachting in peace. Early in the year, the Metro Board of Directors adopted the 30/10 Initiative as official Metro policy after the idea was first championed by L.A. Mayor Villaraigosa in the fall of 2009. The idea is simple: use federal loans and other financing to build a dozen Measure R projects over the next 10 years instead of following the 30-year Measure R schedule. That would greatly expand transit to the regional’s employment centers and also extend transit’s reaches deeper into communities in L.A. County. Parts of 30/10 will almost certainly need Congressional approval and that is no certain thing…. …But the Obama Administration’s loan for the Crenshaw/LAX light rail line is an example of what 30/10 aims to do — and a sign that at least the White House is listening. In a sign of support for L.A. County’s 30/10 Initiative to build Measure R projects more quickly using a variety of federal funds, the U.S. Department of Transportation allocated more than half a billion dollars in discretionary loans to begin construction of the Crenshaw project. The loan may help complete the project by 2016 instead of the original 2018 timeline. The loan may also free up some funding for use in other capital investments projects. It was a huge win for the county and a sign that the Obama Administration is aware of 30/10 and its potential. For the second consecutive year, Congress failed to authorize a new six-year transportation financing bill — the same kind of bill that will likely include the necessary language to fully enact 30/10. One big reason for this foot-dragging is the refusal of most politicians to even consider raising the gas tax, which is earmarked for transportation infrastructure investments. 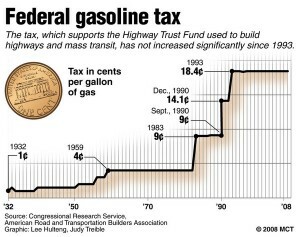 Attentive readers will recall that the federal gas tax has remained stuck at 18.4 cents per gallon since 1993. Because the tax is not indexed to inflation, it has slowly lost its buying power over the years, prompting Congress to kick in general funds to cover the deficit. For the next two years, the effort to direct more federal funding to transit investments may have gotten more difficult. Not only did transit champion Minnesota Rep. Jim Oberstar (D-Minn.) lose his reelection bid to the House of Representatives in November, the new House Transportation and Infrastructure Committee features a majority comprised entirely of representatives of suburban and rural districts. It remains to be seen how inclined they are to support urban transit projects. After decades of changing political winds, ever-slowing traffic, and financing issues, the Metro Board of Directors in October selected a locally preferred alternative that will extend the Purple Line west to the VA Hospital in Westwood from its terminus at Wilshire and Western. It would mean a 25-minute ride from Union Station to Westwood — cutting in half current transit times. At the same meeting, a fully underground Regional Connector was approved that will directly link the Gold Line to the Blue and Expo lines with three new stops in downtown Los Angeles. The day it opens, Angelenos will be able to grab a one-seat ride from Santa Monica to East LA or Azusa to Long Beach. Like the Westside subway, the Connector was another project that has been on the books for many years, but could never quite muster enough political support to get it built. Of course, Measure R — the half-cent sales tax increase approved by county voters in 2008 — made both projects possible. Transportation coverage in L.A.’s media outlets has taken a hit in the past few years. But picking up the slack have been a slew of local blogs by transportation enthusiasts, advocates and even public agencies themselves — like, say, your humble transit blog The Source. But we’re far from the only store in town and it truly has been a great year for transportation blogging. LA Streetsblog relaunched under its own leadership board (full disclosure: I’m a member) and plans to expand its coverage with writers in Long Beach, Northeast L.A., the Westside and beyond. The Los Angeles Department of Transportation launched a Bike Blog to help keep locals up to date on its plans to make the city a more bike-friendly place. Siel Ju, who wrote extensively about “de-car-ing” as Green LA Girl joined KPCC’s environmental blog, Pacific Swell. And of course, this year Joel Epstein has added his vital voice for transportation reform in Los Angeles at the Huffington Post. Across the Southland, cities have begun to embrace bicycling as a legitimate form of transportation. In 2010 several took steps to create infrastructure that support this healthy, carbon free and traffic-reducing method of commuting. After working extensively with bicycle advocates, the city of L.A.’s Planning Department has finally produced a bicycle plan that is widely supported and includes the Backbone Bikeway Network. Meanwhile, the second largest city in the county, Long Beach, is making great headway in its plan to become the most bike friendly city in the U.S.
Come 2013, the tens of thousands of Angelenos who travel by bus through the Wilshire corridor every day will see a boost to their travel speeds. At its December meeting, the Metro Board gave its initial approval to a project that will add a peak hour bus lane to Wilshire from the Santa Monica-L.A. border to the MacArthur Park area, although about one mile of lanes was removed from the Condo Canyon stretch of Wilshire in Westwood. Of all the public transportation investments in L.A. County right now, this one probably offers the biggest bang for the buck. The project will come back to the Board in the spring. America’s petroleum-based transportation system has a profoundly negative impact on our health and environment. But sometimes its deleterious effects — whether it’s asthma or toxic runoff — are out of sight and out of mind. When a BP oil well off the coast of Louisiana exploded and spewed sticky oil into the Gulf of Mexico for months, the high cost of our transportation was put in stark relief. The long term question remains: Will Congress take action to support transportation systems that do not rely on off-shore drilling and importing oil from politically volatile nations? On this point, cities and states are already leading the way. In January, California’s High Speed Rail project got a major boost when it won $2.25 billion in Federal stimulus funds. And there have since been additional infusions of federal money. The California High-Speed Rail Authority says the money will be enough to build track and stations between Bakersfield and Madera, just north of Fresno. This initial segment is a critical piece of the project, even though it isn’t intended to be operational until the line is built all the way from San Francisco to Anaheim. In other words, the project has a long ways to go. I count myself among those who were excited, even optimistic, about L.A.’s first open streets celebration. But I don’t think anyone expected the turnout, the unbridled joy and the ebullience of that day. Even the L.A Times understood that, on that October day, the car’s reign was overthrown in a peaceful coup by the bike and the sneaker. At its core, CicLAvia was an act of transportation revolution, and for that reason I think it was this year’s biggest local transportation story — although I’m sure some of you will disagree. If you missed it, check out this video and come out for the next CicLAvia on April 10, 2011. Agree or disagree with my choices? Or feel I left any stories off my list? Leave a comment! The gulf oil catastrophe was the biggest transportation news story. Unfortunately. Next, probably commitment by the Board for the 30/10 Initiative. Next step, getting the necessary Federal buy-in.